About Us | ..:: Benteng Hotel Pekanbaru :..
Benteng Hotel Pekanbaru is newly first boutique hotel in the Capital City of Riau Province, Pekanbaru. We combine business & leisure for our guest providing good minimalis room accommodation, great culiner, excellent premium coffee tasted and entertainment place with high standard sound equipments and high speed internet network. 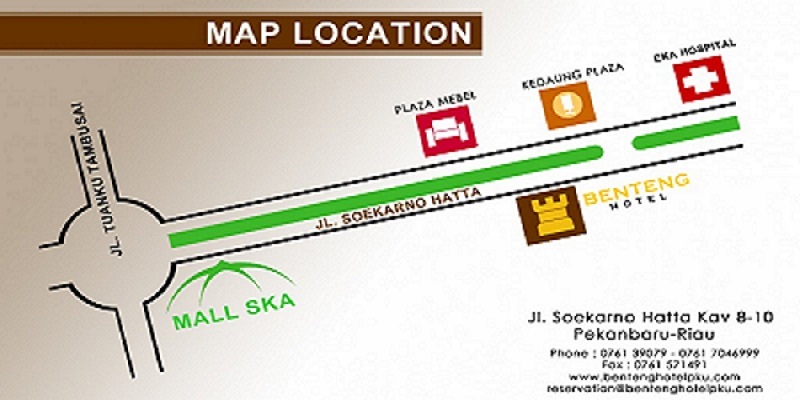 Located in the fastest grown business district area, Arengka, sorrounded by corporate business companies and 500 meters away from the biggest mall in Pekanbaru, MALL SKA and also EKA HOSPITAL. 15 Minutes away both from International Airport, Sultan Syarif Kasim II and Sungai Duku Harbor as an entrance spot to get into the city. 10 Minutes away from Governor Office and other government offices sorrounded it as well as National Corporate Offices. Warmest welcome given to you from our well-trained staff starting from the check – in process until the day you check out. It seems you never leave home while doing business or leisure.